Omis is a small maritime town situated at the mouth of the River Cetina. It is among the most beloved tourist destinations in Dalmatia due to its amazing natural beauty, rich and exciting history, diverse beaches and wide span of tourist services. 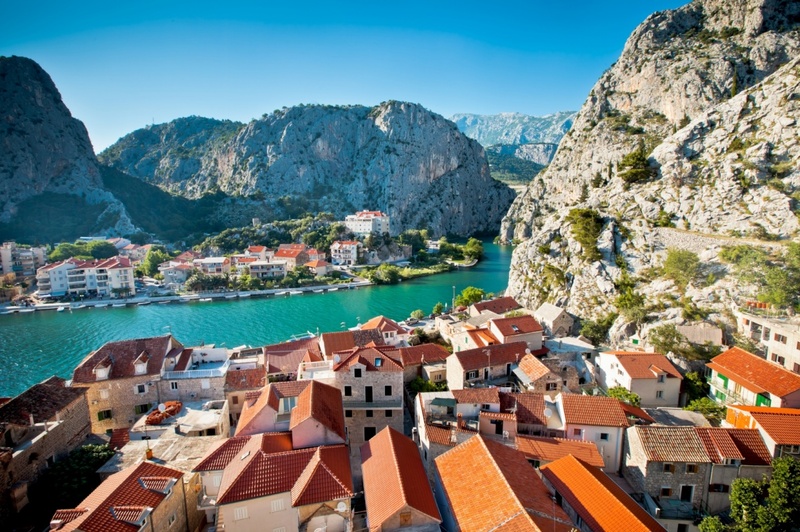 Omis is a perfect getaway destination if you are tired of the noisy city crowds. The combination of fresh air, unique natural sights, countless recreation possibilities and of course, exquisite local cuisine; makes Omis the perfect place for your summer holiday. If you find yourself missing the liveliness and splutter of the big city, Split, the biggest city on the Croatian coast, is only 20 km away. Split is also the main intersection of all traffic routes that will eventually lead you to Omis. So, once you arrive to Split, board one of the regular buses going towards Omis. If you travel in your own car, just follow the Adriatic Main road until you arrive to Omis. It is a 30 minute ride. Omis offers a variety of accommodation options. You can stay in one of the three city hotels: Villa Dvor, Plaza or Brzet; or you can seek private accommodation. There are several options and prices (ranging from 20 to 160 euros per day) depending on your preferences. If you like a more adventurous holiday, there is one auto-camp in the area. The specific geographic position of Omis determined its history. Situated at the mouth of the River Cetina and below the intersection of three powerful mountains (Mosor, Dinara and Babnjaca), Omis has always been a safe harbor and a perfect spot to overlook the surrounding area. Although Omis has a long history going all the way back to the prehistoric and ancient times, the most prominent part of its history is the medieval period. In those times Omis was the notorious pirate lair; its pirates being among the most dangerous in the entire Mediterranean. The pirate tradition was nurtured for many centuries and governed by the local noble families. Due to frequent and cruel pirate attacks, Omis was often in war with the neighboring cities. The pirate tradition stopped in the renaissance period with the arrival of the Venetian dominion, but the legends and the exciting aura of pirate adventures remained in Omis until the present day. Today’s Omis is primarily the touristic town, completely dedicated to its guests. Omis Riviera has 30 km long coastline with all kinds of lovely beaches. As a result of proximity to the river mouth, many beaches are covered in sand, which makes them perfect for families with children. The town’s most popular is “The Great Beach” with its 1 km long coastline. The water temperatures are pleasant for bathing from early May and remain that way until late October. The beauty of Omis exceeds its lovely beaches and breathtaking coastline. The canyon of the beautiful river Cetina is a truly unforgettable sight. It is the place where the powerful river interrupts the great massif. The mountain tops are offering an amazing view of the surrounding area with the nearby islands. There are almost countless options for recreation; from rafting, paragliding, parachuting, cycling, free climbing and hiking to the usual water sports at the seashore. If you wish to learn more of the turbulent history of this area, take a simple walk through the town. There are numerous ancient villas, medieval and baroque churches as well as two legendary forts on top of the surrounding mountains (Fortica and Mirabella). Omis hosts numerous culturally important events, most of them during the summer season. It is interesting to attend the Festival of the Dalmatian Singing Groups. It is a special experience; soaking up the unique and powerful sounds of the Dalmatian a-capella singing. Omis Cultural Summer is filled with theater and concert performances, exhibitions and recitals. The nightlife in Omis is not as rich as in some bigger cities, but it perfectly corresponds to the idea of a peaceful getaway destination. You should focus on the rich gastronomic offer during your stay in Omis and try as many local specialties as you can. And if you seek for a more dynamic night out, head towards one of the beach bars or better, make a short trip to Split, which is only 20 km away, and enjoy the rich nightlife offer of the big maritime city. Find information about selected Hotels, apartments and rooms in Omis to choose the perfect place for your accommodation.